From Hidalgo Industries comes Manchego cheese Campo Mancha, one of the Spanish flagship cheeses made with manchegan sheep raw milk and with Denomination of Origin. The curing period of this Spanish cheese is between three and twelve months. With lactic odor, intense and persistent flavor that evolves towards acidified spicy nuances in more mature pieces. Thermoformed vacuum packaged. 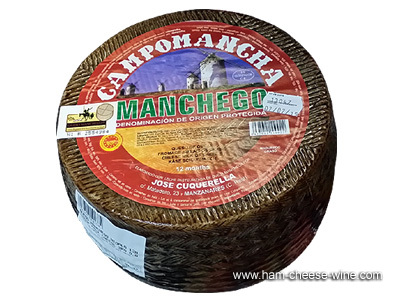 Among the organoleptic characteristics of Manchego cheese Campo Mancha stand out its pale yellow or green blackish hard bark, along with the presence of casts impressions of straw belts in the lateral sides and flowers in the flat sides. The mass of this cheese has a homogeneous appearance, varying in color from white to ivory -yellow. When cut this Spanish cheese has small eyes unevenly distributed across the surface, though sometimes there are no eyes at all. Manchego cheese Campo Mancha texture is of low stretch, buttery and slightly powdery, which can be grainy in very mature pieces. As for the taste, Manchego cheese Campo Mancha is slightly acidic, strong and tasty that becomes spicy in old cured cheeses. With a pleasant and distinctive taste that gives Manchego sheep's milk, the multiplicity of its flavor depends on the cure, but it evokes walnuts and burnt caramel, with a slightly salty taste, while the aroma reminds of roast lamb. The waxed bark of Manchego cheese Campo Mancha must bear the old typical zigzag mark of the straw belt in the lateral sides. The wax color denotes the age of the cheese and the mass should be ivory. Quesos El Hidalgo offers the manchegan cheese with denomination of origin, artisan-made with raw milk of manchegan sheep. 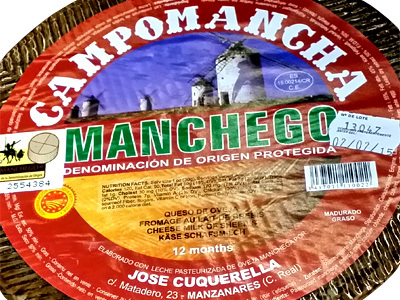 The proportions of nutrients in Manchego cheese Campo Mancha may vary depending on the type and amount of cheese, as well as other factors that may be involved in the modification of its nutrients. 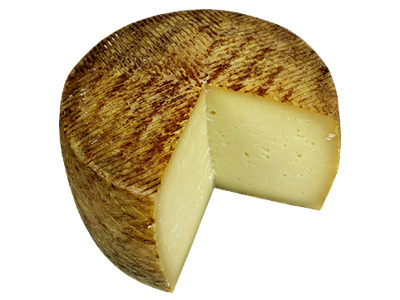 Note that the properties and nutritional characteristics of Manchego cheese can vary according to its preparation.